There was just too much on the line. 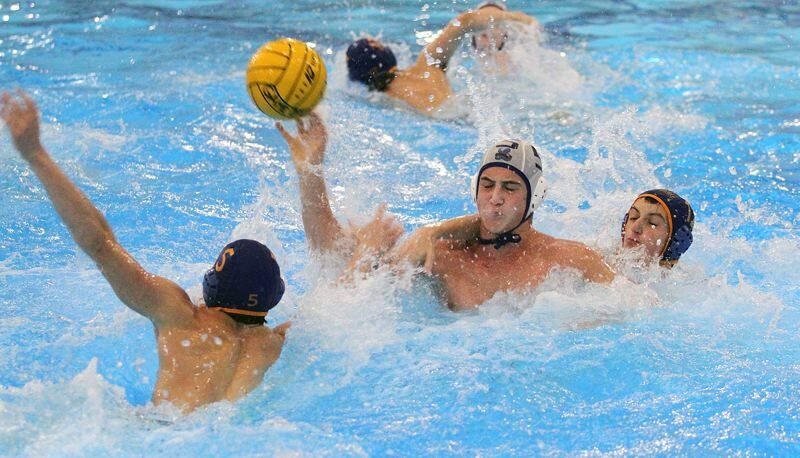 There was no way the Lakeridge boys water polo team was going to let this one get away. And the Pacers did not, blowing past Metro League champion Southridge 17-7 in the semifinals of the Oregon High School Water Polo state playoffs at Tualatin Hills Aquatic Center on Friday. With the win, the Pacers advanced to Saturday's OHSWPC state championship where they dropped a 6-3 decision to Newberg. For more on that game, see the accompanying story. Their performance at this year's state tournament has the youthful Pacers — they graduate just seniors Grant Lautze and Cole Dennett — excited about what might lie ahead. "I'm just really proud of my team. I'm really proud of them," said junior Brody Veater, who scored twice against Southridge. "We'll be back next year." "It's only the second time and Lakeridge history that we made it to the state championship," said junior goalie Nathan Bloom, who made six saves against Southridge. "I think next year we are probably going to win." The Pacers had to earn their win against Southridge, though, after seeing the Skyhawks fight their way to a 3-3 tie after one period. In that opening quarter, Lakeridge got goals from Torin Ferguson, Thomas Gooding and Lautze, but Southridge matched that with scores by Hayk Bulgadarian, Aleksa Sisakovic and Noy Gurman. But Lakeridge turned up the pressure in the second quarter, shut out the Skyhawks for a span of 20 minutes, 1 second — a run that spanned from the first quarter into the fourth — and used a 5-0 second-period edge to grab an 8-3 edge at the half. Ferguson and Lautze each scored twice in the quarter and Veater once. With the Skyhawks kept off the scoreboard again in the third quarter, Lakeridge boosted its lead to 11-3 behind goals from Lautze (two) and Veater. And even though Southridge finally scored again in the fourth stanza — getting goals from Sisakovic (two), Grady Killian and Cameron Rogers — the Pacers added another six to their night's total. In that final period, Lakeridge saw Oscar Loureiro Alvarez connect three times while Gooding, Lautze and Konstantin Karyukin added one each for the final 17-7 margin. For seniors Lautze and Dennett, the team's return to the state tournament meant everything in their final season. "It's just been building up every year," said Lautze, who led all scorers with five goals. "My freshman year, we finished fifth place, my sophomore year we finished third and now we've been second twice in a row. I just think the worth work ethic has changed. Everyone kind of realized what we've got to put in and we worked a lot harder." "My freshman year was the furthest the program had gotten, and then every year building off that, it got better and better and better," Dennett said. "I've seen a lot of team chemistry, a lot of team bonding. We work together as a unit. We just try to bond as much as possible."